Over the summer I was invited by the Keys Tourism Board to tour the beautiful and oh so sunny Florida Keys. I know, it’s a tough job but someone has to do it. You can imagine that when the invitation arrived, it took me all of two seconds to say yes and thank you. Thank you very much. I had actually never visited the Florida Keys prior to this visit and I can honestly say that it was better and more beautiful than I could have ever imagined. I’m actually thinking that now would be a VERY good time to pack up and go for another visit. The people, the food, the restaurants, the hotels, the WATER, seriously I fell in love with the colors of ocean. 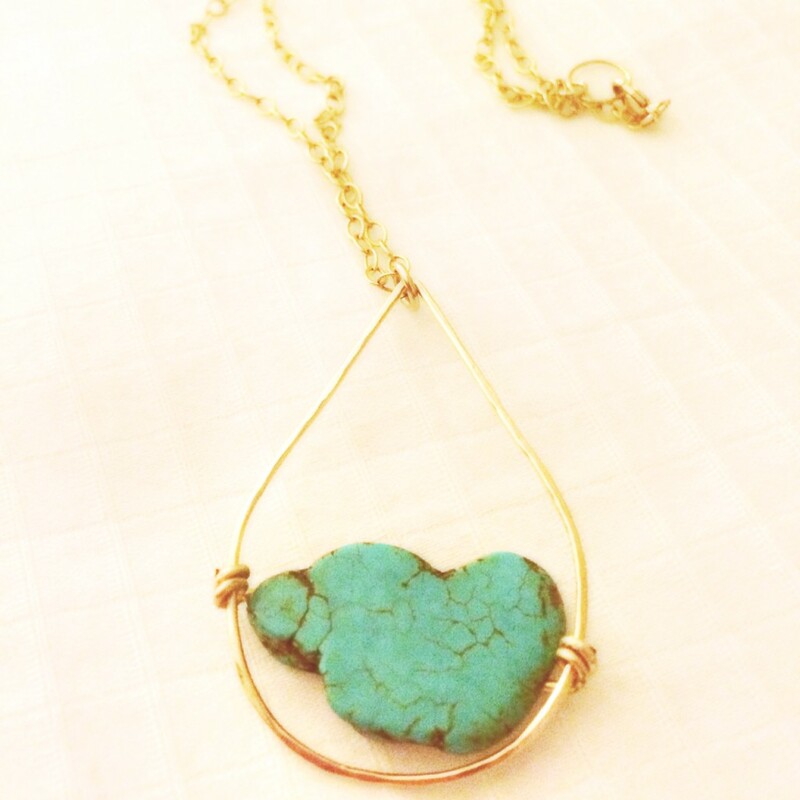 So much so I bought a necklace off a gallery owner (true story) that reminded me of the water and my trip. If you follow me on nstagram, and Twitter you may have seen some of the FOOD, frolic and fun that we got to sample along the way. We ate, ate and ate again. All to report back to you of course. We’re givers people. Givers. Naturally being in the Keys we were on a mission to find the BEST Key Lime Pie and after about 9 I believe we have a winner. This Islamorada landmark has been operating for 18 years on Lowe Matecumbe Key. The marina has everything from fishing charters to snorkel trips, kayak rentals, shops and their famed restaurant, The Hungry Tarpon. Robbie’s and The Hungry Tarpon is a seaside watering hole, full of lively people. 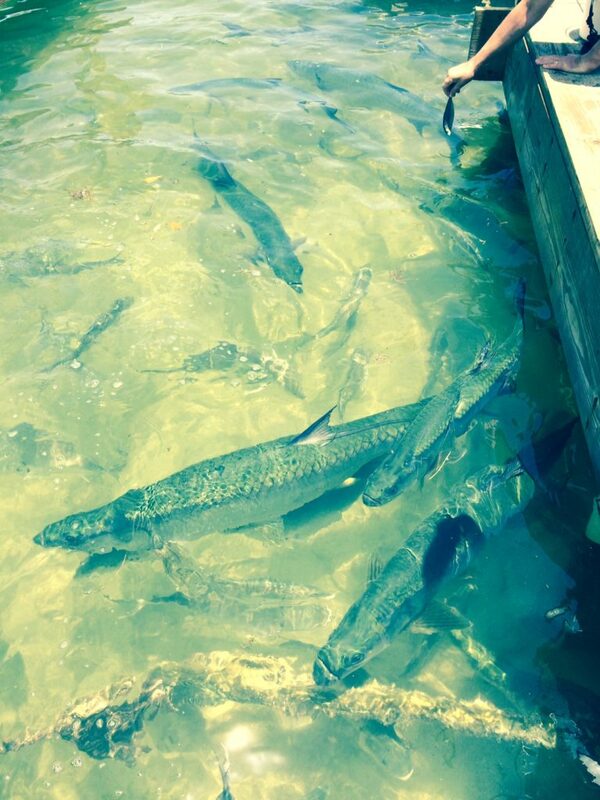 I feasted on shrimp tacos, we took in a little roadside shopping, and feeding the tarpon! Those fish are HUGE, bigger than any I think I’ve ever seen and jump up out of the water when you feed them out of your hand! Good thing they don’t eat people. Then we checked in to our hotel Cheeca Lodge, where we spent two fabulous nights. Cheeca Lodge is an award winning hotel, steeped in history and a true traveler’s favorite, we were soon to realize what all of the fuss was about. Island perfection. This is honestly one of the nicest hotels I’ve EVER had the pleasure of staying in, and I’ve stayed in some swanky places people. It has stunning views on a white sandy stretch of beach, a dock that went seemingly forever into the sea, crystal blue swimming pools (yes multiple pools), a spa, and even shopping. They even greeted us with champagne at check in. Happy. Camper. Here. My suite consisted of a large living area with a LARGE sofa (enough room to have hosted a party) a flat screen TV, coffee table, and wet bar opened up into my sleeping area with desk/table and a king bed that was so comfortable I never wanted to leave. This area led onto a huge deck through sliding glass doors to a balcony. What was on that balcony? An outdoor TUB. The water fell into the tub through the ceiling. Seriously. Wow. I could re-enter my room from the balcony through the shower- yes- the shower, which was entirely made of glass and had every imaginable sprayer. Two glass bowl sinks, upscale amenities (I’m a detail girl and appreciate those nice hair and bath products). I could have lived in that bathroom. I honestly cried when we had to check out. Named one of Travel + Leisure’s 500 Greatest Hotels in the world, Cheeca Lodge & Spa is a 27-acre property known for its accommodations, tradition of “barefoot elegance,” wide Atlantic Ocean beach, fine dining and spa. In addition, Cheeca Lodge is home to some of the top fishing tournaments in the county. That evening we had the pleasure of dining at MARKER 88. We were treated to our own very special table beach side. Here I ate one of the best crab cakes of my life. I could honestly eat seafood every. single. day. Marker 88 is owned and operated by Upper Keys chef Bobby Stoky, Stoky also owns four other Upper Keys restaurants, Marker 88 has been open since 1967 offering beach side dining and some of the Keys’ freshest seafood. The next day we went for an outdoor excursion. Paddle Boarding. I admit I was slightly panicked about this. You see, I’m NOT coordinated. At. All. Our instructor was a gem though and insisted I could do this. My competitive nature (read I’m stubborn) made me get off my cowardly sitting position and stand up on the board. I actually did pretty well for the first hour. WELL that’s until a sting ray decided to swim under my board. Then all bets were off as I went INTO the ocean. No worries, despite my lack of coordination, I’m extremely quick and bounced back up onto the board faster than you can say SHIZZLE. As you can tell, I made it out and ended up having a blast. If you’re in the area, check them out. I hear that SOME people also do Yoga on Paddle Boards. I’m not one of those people. Otherside Boardsports is a unique company focusing on all types of water sports. Their storefront serves primarily as a retail source and demo center with a family-oriented atmosphere. 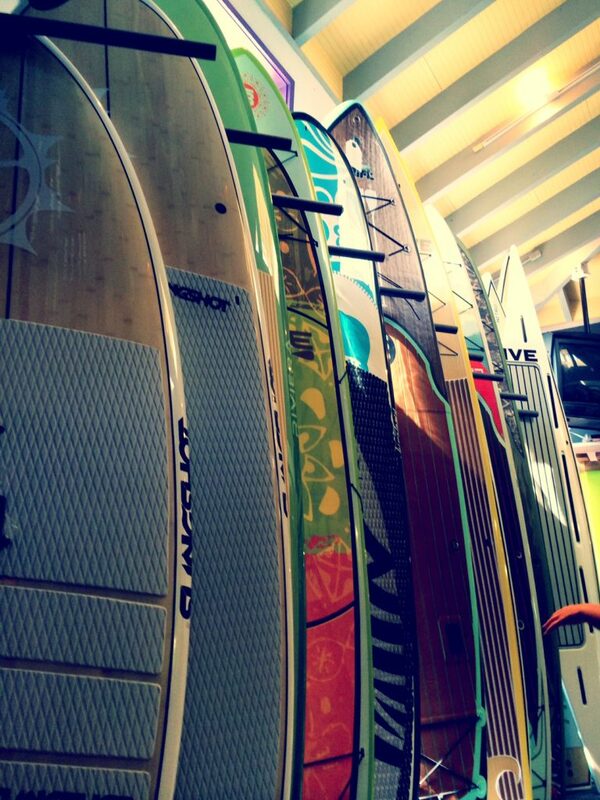 Staffed by a highly knowledgeable team, they specialize in kiteboarding, wakeboarding, wakesurfing, skating, stand-up paddling and water apparel. Michelle Lowe’s gallery contains original paintings, prints and gifts including clothing items, stylized smartphone cases and more. 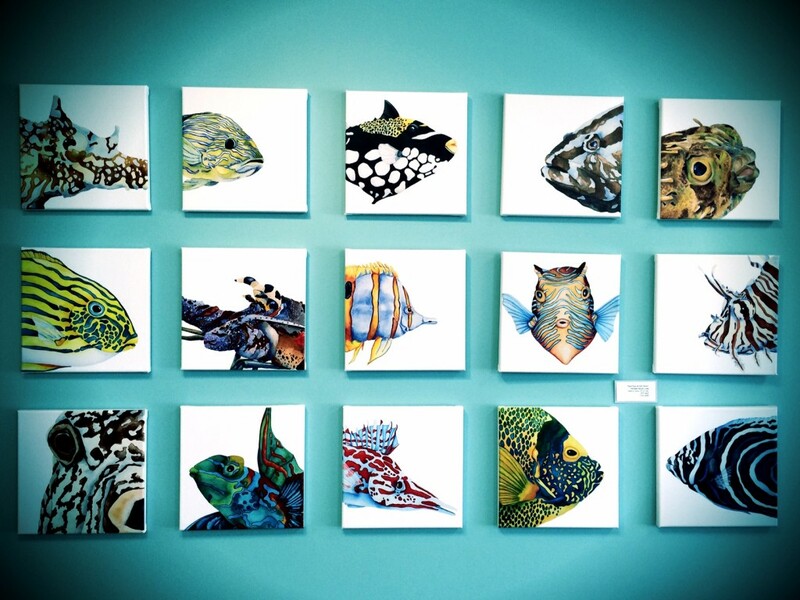 A native South Florida resident, Lowe spent her childhood snorkeling and fishing in the Florid Keys, hence her artistic focus on ocean life. After a successful stint in the corporate world, she has returned to the Keys to focus on her art. Our first two days in Islamorada were packed full. We had an amazing time and I can’t thank those listed above enough! I’ll be sharing out my second two days in Key West soon! Want to visit The Florida Keys? Of course you do! I know I’ll be going back and hopefully sooner rather than later! OMG I am eaten with envy. Normally I am not envious, but some travel stories push me into it. I have always wanted to visit the Keys. I had a wonderful visit to Florida about 4 yrs ago. Even though I was lucky enough to see a wonderful variety of places, I ran out of time for the Keys. Your pictures were great. What a wonderful opportunity for you. I wish someone would ask me to go the Florida Keys…haha. This looks fabulous! Totally what I’m craving on this frosted window cold day. What an amazing trip. 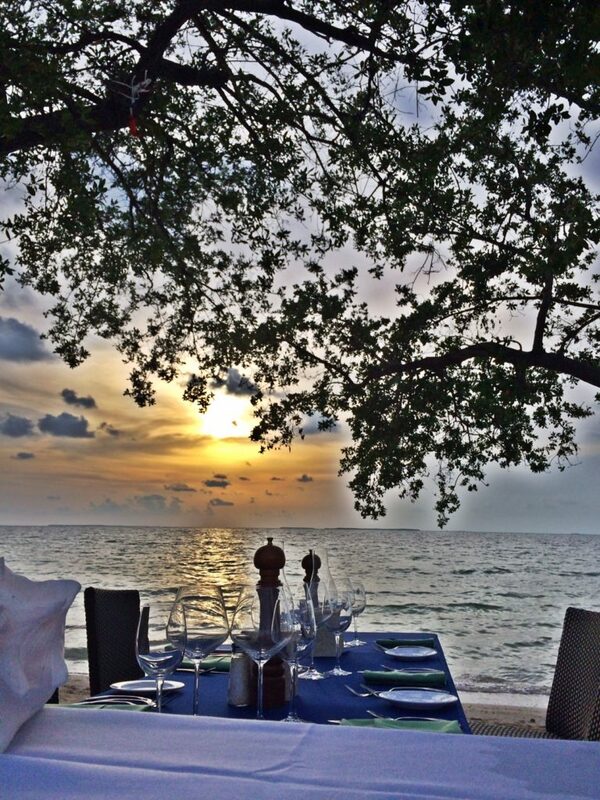 That backdrop of the beachside dining looks so serene and beautiful. We haven’t been to the keys in way too long. This trip looks amazing! I love all your pretty pictures! I’m with Brandy, ask us next time 😉 Love your photos, they are GORGEOUS. I have never been to the Florida Keys, but need to change that soon. What a gorgeous spot! And that bathroom…like a dream come true. I haven’t been to the Keys in years! Now I want to go back. Beautiful! What a gorgeous place!!! I have not yet been to the Florida Keys. Gotta get there one of these days! 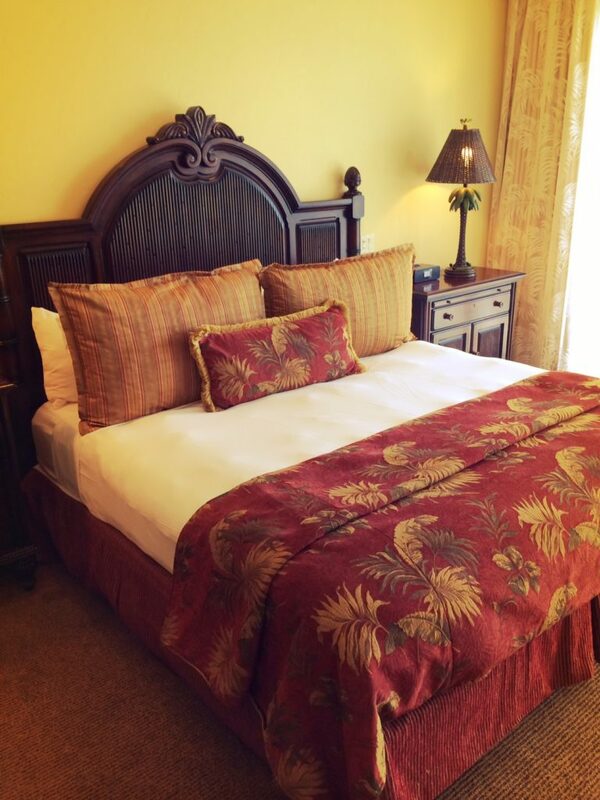 Sounds like you had a fantastic time at the Florida Keys. I visited once for vacation ions ago when I still lived on another continent and remember the Keys fondly. I love the keys!! I went a couple of years ago for the first time and it was breathtaking. I’m so jealous! what an amazing trip and your photos are breathtaking! I remember seeing some of these photos in your Instagram feed! I was jealous them and now you went and made me jealous again! Its been on my mind lately to take a non-Disney trip to Florida with the hubs & kids! I think we would all love it! 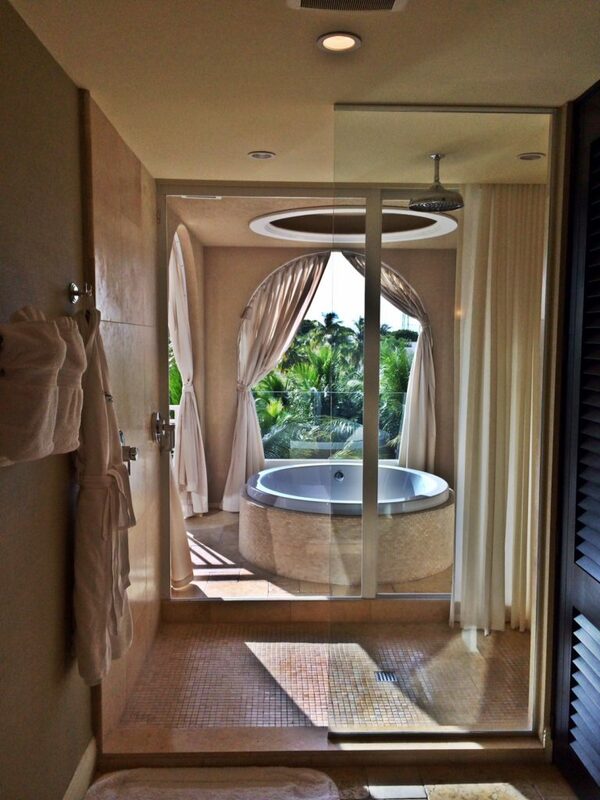 Thanks for this post (I need that tub & view in my life)! Okay, you got me sold on every aspect of your trip. 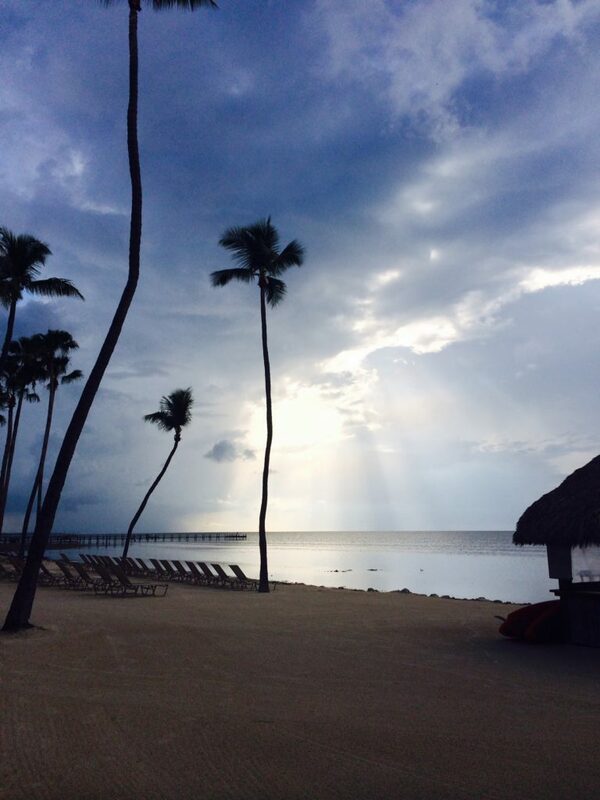 I love the Florida Keys and Islamorada. My husband and I have to go back. Thanks for all the info. omg that shower… I would never leave the hotel (tmi? haha). I really wanted to visit the keys when I was in Florida earlier this year but, sadly, it wasn’t in the cards. Hopefully sometime soon! Paula we recently left the Florida Keys after living there for 25 years. We decided to travel the USA and see what others have to offer. 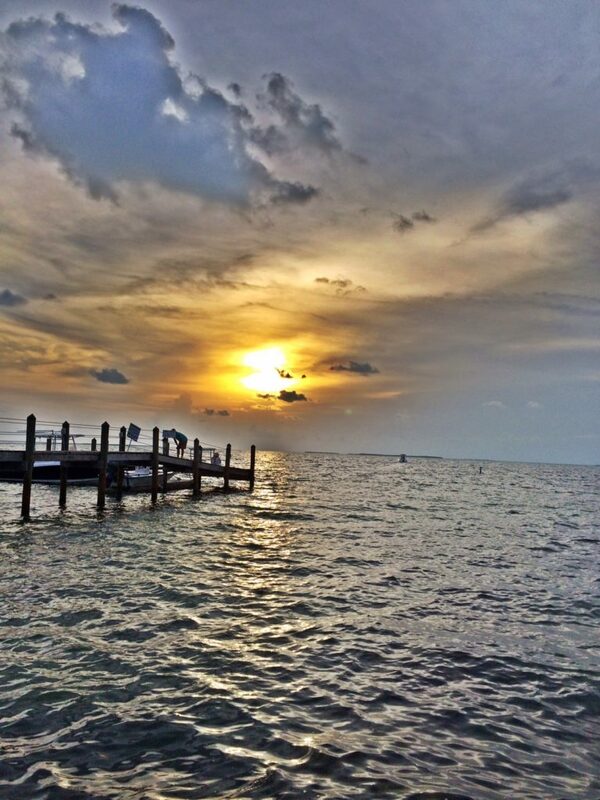 As you state there is NO comparison to the beauty the Keys offer. Bobby Stoky is a friend and you could not have been in better hands. The Stoky family are well respected in the business community. What a great fun trip! I lived in FL for 2 years and never got down to the keys. What a great trip! I’ve never been to the Keys but it looks beautiful! What an amazing trip. You’re room and views are gorgeous! I have heard great things about the Cheeca Lodge, and your photos show just that. what a fun trip!!! Makes me miss our honey moon!